A program to remind you of birthdays, bill payments, and appointments. 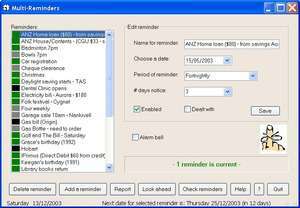 Reminders can be periodic (eg, weekly, fortnightly, monthly, quarterly, yearly). And you can specify how many days notice to give you. Checks for reminders every time you startup your PC. Version 3.04 is a freeware program which does not have restrictions and it's free so it doesn't cost anything. For security reasons, you should also check out the Multi Reminders download at LO4D.com which includes virus and malware tests. Additional screenshots of this application download may be available, too.